This post can also be found in the BDJ team magazine. Just some of the fantastic team who helped out over the weekend! The weekend saw over 50,000 people attending and involved live music over 2 stages, dancing, sports and a real sandy beach! There were lots of stands set-up and the at the public health area we had the company of Healthy Eating, Cancer Research, Smoking Cessation and more alongside our dental stand. 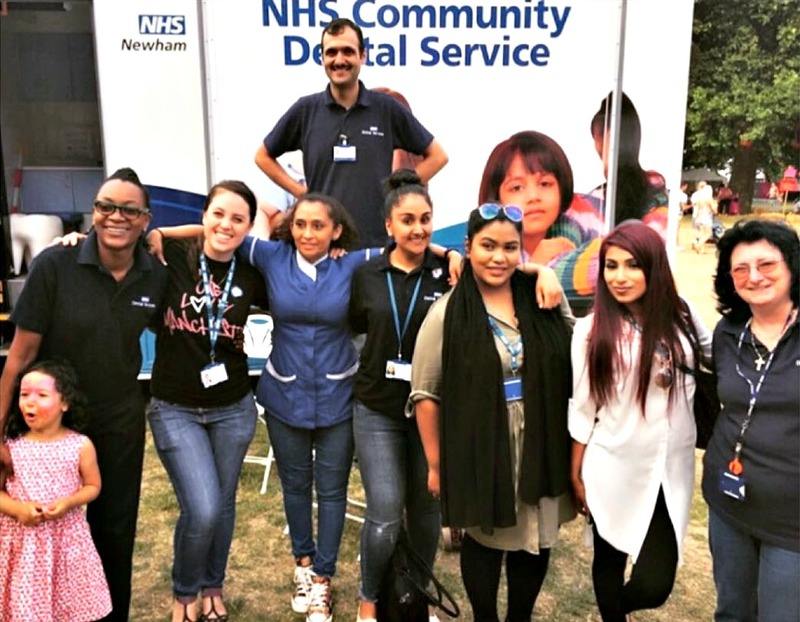 Over the weekend we had a total of 3, 478 contacts at our oral health stand; teaching children and parents about oral hygiene, dental-specific diet advice and going to the dentist. The team included our oral health promoters, therapists, dental nurses and dentists and everyone had lots of fun. It was incredible to see such genuine interest from the public and eager children filling in our quizzes and word-searches or brushing our set of giant teeth in order to win a toothbrush holder or tooth fairy wand! As well as our oral health stand, we were able to provide oral health screening on our mobile dental unit. Over the 2 days we saw 485 adults and children for oral health screens; many of whom required signposting to dentists as they required treatment. 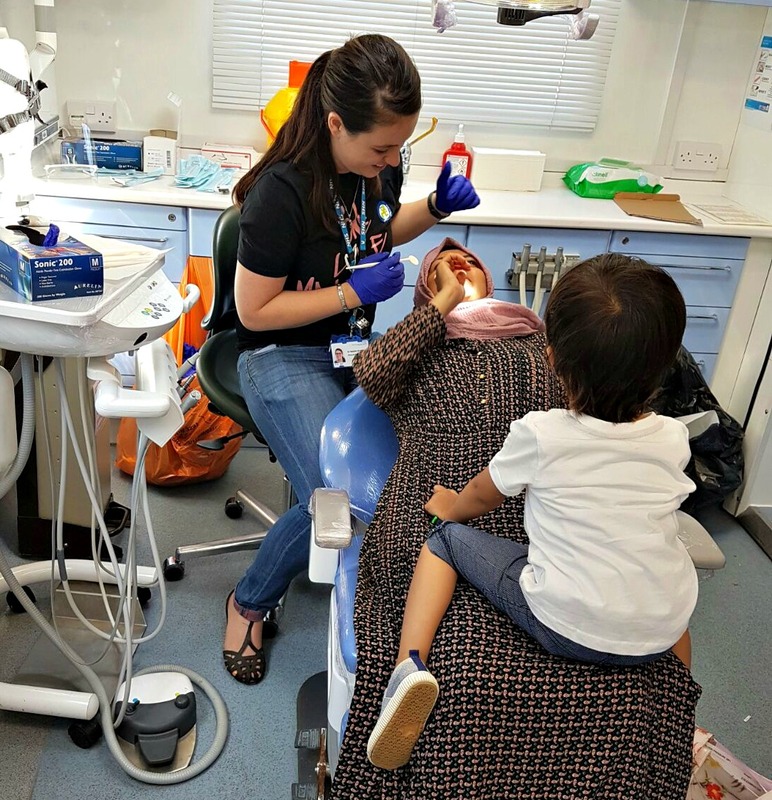 With live music blasting in the background and copious amounts of free toothbrushes and toothpaste to give out, there was a lively and festival-like atmosphere inside the unit that helped to acclimatise some of the more nervous or younger children into learning how a visit to the dentist can be fun! I found it very surprising to see how many people either didn't have their own dentist or had no idea how the NHS dental services work. There were many people who had very healthy mouths, indeed I haven't seen so many cooperative children in a long time; however, there were a few shockers. For example I saw a 3 year old who had around 8 carious teeth and had not ever been to the dentist. It was important for the dental team to direct people onto where they could access care and of course explain how screening did not replace a full dental assessment with x rays. Lists of dentists in the local area were given out as well as information about dental charges and exemptions. We were very lucky that the weekend's weather matched our moods and we had lovely sunshine for the 2 days and certainly I went home on the Sunday evening with a warm sense of fulfilment after such a philanthropic effort from all the team. I think getting the dental profession more involved in public events like this is essential at tackling our public health issues head on and can be really effective with passionate individuals and the appropriate support from NHS services and dental charities such as the Dental Wellness Trust, Oral Health Foundation etc. Did you attend the Town Show? Or run similar events in your area? Let me know in the comments below.